I consider myself one of the luckiest women alive. I'm blessed with a beautiful and intelligent two year old heart breaker. In addition to that I married someone I've known since I was little. He is smart, charming, talented and unbelievably gorgeous!! We've been married almost a year and despite the ups, downs and sideways... I couldn't imagine changing it a bit. It has been AGES since I posted a blog. Life became so hectic and entertaining that I put the computer aside and rode the constantly fluctuating waves. I enjoyed ups, downs and I even think I found myself a little sideways a couple of times. But my life is blessed no matter what challenges I find myself facing. God blessed me with an amazing husband and a exuberant daughter. My prince returned home from a deployment, safe and sound, Chloe passed through a fourth birthday and we moved into a brand new home on base. To say things have been exciting would be the greatest understatement. Now we're preparing for kindergarten roundup and working on baby number two. I know that God knows when the timing is best so we're patiently waiting for our time. Today was a wonderful day spent doing the simplest of things. 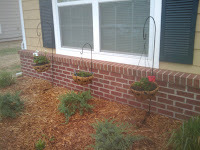 We woke up this morning and went to Lowe's to pick out flowers for our hanging baskets out front. The hubby decided he wanted a red, white and blue theme which worked our perfectly as we have three beautiful baskets hanging out front. It was fun and Chloe enjoyed herself. You can see our baskets below :). more blogs to come. God bless each and every one of you. It has been quite nearly an eternity since my last blog. I blame it on the roller coaster of a life I live. I never have enough time to catch my breath let alone write a blog. But since hubby is officially deployed and its just Chloe and I flying solo for awhile I will definitely be blogging more often as I am going to have plenty of free time on my hands. I don't have a lot to say today. Sunday is the day in which I allow myself to be completely and utterly brain dead so instead I will just post a few pictures of Chloe, who turned the big numero tres on Sunday! 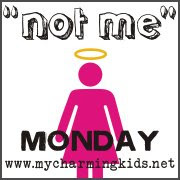 I have been a blog neglector lately. I feel horrible about it but I have been so immersed in life that I just haven't had time to sit down in front of the computer and put my thoughts onto "paper". Opportunity struck today when I had to spend the day at home with Chloe, as she had a bit of a temperature this morning, and now that it is nap time for her I can tappity tap tap on the computer. This week has been a trying one, even though it is only Tuesday, as we received some not-so-pleasant news from our Assistant Business Office Director, Danna, on Friday. It seems that census is down at our hospital so they have cut all non-clinical employees down to 32 hours a week. Now I know that it may not seem like much when you put it in perspective with the large amount of individuals out there who can't even get employment, but it does make things difficult for us as I share joint custody with Chloe's dad and am court ordered to drive to Wichita twice a month ( 2 1/2 hours away) twice a month so that her father can have his week with her. This is quite costly since gas has begun creeping back up. My student loans come due next month and even though my pay just decreased by approximately $300/month, I will still have to figure out a way to make enought to pay my $150.00 student loan payment. I think that what I shall do is try to get on as a bagger at the commissary on my day off during the week, Wenesday. They don't get paid an hourly wage but they do make tips and I could cram those tips into a jar and hopefully make enough each month to pay those student loans. I am trying my best to put my worries in the Lord's hands. I know he will carry me when I cannot carry myself but sometimes it is hard when you are the control freak that I am. On a sunnier note, I did put in for a job working for the State of Oklahoma. Even if I start out at the minimum I would be making $3/hour more than I do right now which would be extremely beneficial to our family. So I am keeping my fingers crossed that this is the opportunity I have been looking for :). Well my dryer just dinged at me so I guess I should fold the clothes before they wrinkle and get my Honey and I's sheets/comforter into the dryer so that we have something to sleep on this evening. So today I went for what I thought would be a regular ol' 2 mile walk here on base (the trail they commonly refer to "golf course"). Little did I know that I'd make myself a new pal because of my attempt to make a change from a very sedentary, and altogether unhealthy, lifestyle. I left my apartment here on base with my phone in hand and my earbuds in place, listening to an old favorite, "Fancy", by Reba) and set my pace at a very brisk walk. Enough to raise the heartbeat but not enough to be lightly jogging. At about a half-mile into my walk a gentleman, probably in his late thirties or early forties, jogged up next to me. As a courtesy, as I was definitely not going his pace and would definitely be passed, I moved to the side of the trail to let him get by and muttered my usual cheerful "Hello there and how are you?" Normally I get a smile, a muttered response and I am passed. However, this was not to be the case today, Mr. Motivational (as I shall call him) slowed his pace to a brisk walk as well and asked me how I was doing. I was a bit taken aback and searched my head for an appropriate answer. I wanted to be polite but didn't want to drown him in information. So I told him I was wondeful and was out for a walk as I am making a lifestyle change. This intrigued Mr. M. So he asked if I thought I could increase my pace into a very light jog and keep pace with him. I told him that I am definitely out of shape as anyone could see but that I'd try. He then told me that he'd chat with me to make it seem as though we weren't jogging, just having a casual conversation. Anywho, Mr. M and I continue at this pace and as he promised, we chatted it up like old pals. Mr. M asked me to explain to indulge him and explain what has made me decide on a lifestyle change... and I did. I divulged to him that I had been obese since my chubby cheeks graced this world with their presence, that I have an longing desire to join the Air National Guard and that I want to find a simple sort of satisfaction with the way I look. I know that I shall never be perfect and I wouldn't want to be either, but I don't want to be disgusted by myself either. (After I had diarrhea of the mouth and spilled all this to this complete stranger, I started to feel very silly and began to ponder if he was going to make fun of me as this gentleman was the perfect example of being physically fit) Mr. M once again caught me off guard when he began to tell me HIS story. Mr. M is an AF retiree who still continues to work at Tinker. But his story began over 20 years ago. Mr. M, alot like myself, was overweight his entire youth and shortly before he went to Basic he found a friend who was a pro in the area of weight loss so Mr. M asked him for help creating a regiment to lose weight. M lost over 100 lbs before he went to see a recruiter. M explained to me that although he is fit and lives a very healthy lifestyle, there is still a chubby 17 year old in side of him and that will never change. He said that when he started losing his weight he had a hard time stopping, but through trial and error he learned that setting a reasonable and attainable goal, and maintaining that goal once you hit it, was the key to not becoming that overweight child again. He told me that he knew, without ever having seen me before today, that I could reach whatever goal I set. I was nearly to tears at this point. We continued to jog and discussed our careers and before I knew it M tapped me on the shoulder and slowed the jog to a brisk walk again. By this time we had hit the officers club which meant we'd jogged a complete mile in what seemed like seconds to me (which to some is chump change as far as exercise but for this chunky chick it is amazing). He really had upheld his word when he said he'd keep pace with me and keep my mind off of the distance. M walked the remaining half-mile with me. As we were about to part paths Mr. M told me that he'd be here the same time next Wednesday if I needed a pal to keep me motivated. And to think I had almost pushed the idea of going for a walk out of my head. Hope you enjoyed!! I didn't get to snap as many of our family as I would have liked as we were just having to much fun to take pictures!! Hey, I just wanted to post a quick note that although I have really started blogging lately, it is probably going to come to a standstill for the most part over the next two weeks. Christopher will be home from his field exercise today and I plan on spending every moment of the next two weeks enjoying my husband while I still can. So if you don't hear from me for a while, I am still here, still alive and definitely thriving. Just taking advantage of what few moments I have left.